November 13, 2016 By Chelsey 1 Comment This post may contain affiliate links. Read my disclosure policy here. Want a way to keep Christ in the hearts of your children all season long? When I was a younger, about 10 years old, my mom read our family a book called The Last Straw or here. It is a sweet little book that teaches the importance of service and kindness in the family. My mom built a little manger that we filled with straw throughout the month of December. Each piece of straw represented an act of kindness or service. 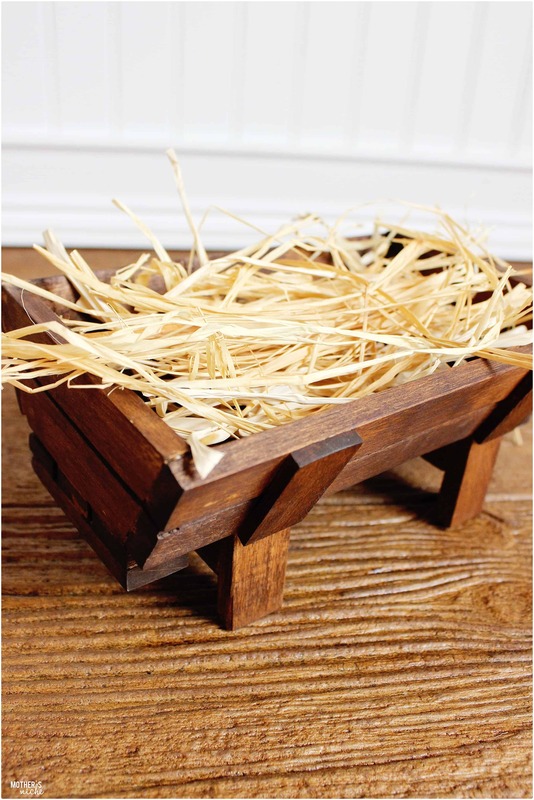 The idea is to make the manger nice and comfy for Baby Jesus when he comes on Christmas morning. I made my little manger out of a 8 foot strip of wood from the hardware store. I didn’t use a pattern, just kinda made it up as I went. I used a nail gun and wood glue to hold it together, then I stained it a walnut color. Let it dry for 48 hours before using it so it has time to cure but also because the stain has a strong smell. I leave a bucket with the loose straw next to the manger. Some of my kids are a little older and I let them put in the straw as they do acts of kindness. When I see them put the straw in I tell them I am proud of them and to keep up the great work. With the little ones I watch for every kind deed, helping someone, cleaning up a mess, giving hugs and kisses, helping with a chore, sharing etc… Then, I tell them thank you for being a kind example and ask if they want to put a piece of straw in the manger. They get excited and run to pick out a piece of straw and gently lay it in there. They are instantly motivated to keep up that service. I have noticed that when I am slow to recognize the good things they do, the motivation slows. So, stay positive, alert and get really excited! On Christmas eve we do a lot of last-minute acts of kindness to make sure that Jesus’s bed is as soft as possible. Then we always read the Nativity story in Luke before bed to remember the reason for the season and the kids get so excited to meet baby Jesus. On Christmas Morning Jesus is there in his little manager right in front. He is always the star of the morning. They all want to hug and kiss him. This cute little yawning baby has been baby Jesus since our first Christmas when we were first married. I actually got this baby doll when I was 9 years old. It has been a beautiful tradition and with the manger in sight, and the straw building up, it helps keep our focus on Christ-like service all season long. WANT TO PINT IT AND SHARE IT? What are some of YOUR Christ Centered Christmas Traditions?!? Wondering if you can share any tips or measurments for the manger? Finished size, length of the longest side, just to better gauge how big to cut my pieces so I only end up using one board. Hehe!